Someone posted a perfectly innocent question in a knitting and crochet Facebook group I am part of: how many WIP (work in progress) do you have? I was surprised by some of the answers people gave. I was expecting that most would have several projects on the go, but some said they had only one! ONE! Wow. I could never have the discipline to work on one thing at a time, not starting something new until the previous item was done. So I started to count how many WIPs I had…. and had to stop at 15. I still had more projects to count but I was suddenly struck by how many of them I hadn’t seen for a while. Where were they?! There are some projects that seems more prone to getting lost than others, like the vanishing vintage hair snood (VVHS) I’m making for my Knit For Victory group. I’ve lost count of the number of times that I’ve felt guilty about not finishing what is such a small simple item, gone looking for it, and found that the wretched thing has disappeared again! What a shocker, the small wisp of black yarn is hard to find! Which is why I put it in the Safe Place. What makes the Safe Place so safe? Why, it’s secret location, of course! It’s so secret it changes all the time and I never know where it is from one day to the next. I’ve become somewhat resigned to the fact that VVHS may in fact exist on a separate plane of existence that is only occasionally in sync with this one, but managing to lose larger WIPs in a one bedroom flat is just downright impressive! Somehow I’d misplaced a cotton cardigan that was over three quarters finished, and it wasn’t a delicate little matinee jacket either. It’s a full (plus) size adult ladies cardy big enough to stuff my large wobbly arms in! The cardigan I’m making has a simple v stitch, which has proved ideal for crocheting in front of the telly. Suddenly just knowing what corner of the living room a project was probably located in was not enough. I had to track down those pesky missing WIPs and finish some of the blighters before they finished me. Regular readers (yes, both of you! Hello Mum!) might have noticed it’s been longer than usual since my last post. There are a few reasons for this, but the search for my missing WIPs (and the resulting chaos) played a fairly large part. 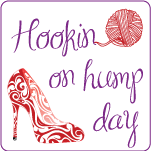 It was a week long event that will henceforth by known as Yarn-ageddon. Or the Craft A-crap-alypse. I’ll make up my mind later when I stop having flashbacks of the cat leaping into precariously stacked heaps of my precious crafting pretties. Don’t look too closely at those eyes! I suspect they may be crochet-eating portals to another dimension! I won’t bore you with all the details, but it’s fair to say it got worse, so very much worse, before it got better. And I found the cardigan! And the VVHS, which has only disappeared twice since its initial rediscovery! The stash of yarn I bought to make my Attic24 bag is still MIA, but I suspect it may be lurking in a secondary Safe Place in the bottom of my wardrobe. So what about those WIPs? So far it’s been good news for Knit For Victory. No, I haven’t finished the VVHS, but I did finish the third air raid warden owl and a string bag, both for them to sell. The cardigan is now just waiting to be sewn up and the edging added, but sadly that still leaves an awful lot of projects waiting to be finished. 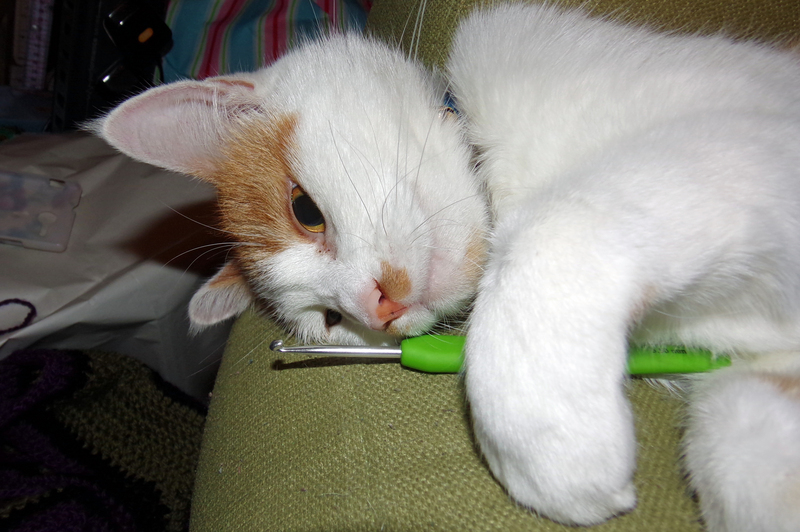 It doesn’t help that I have been lured into taking up the Dark Art again (knitting) which has eaten into my hook time. 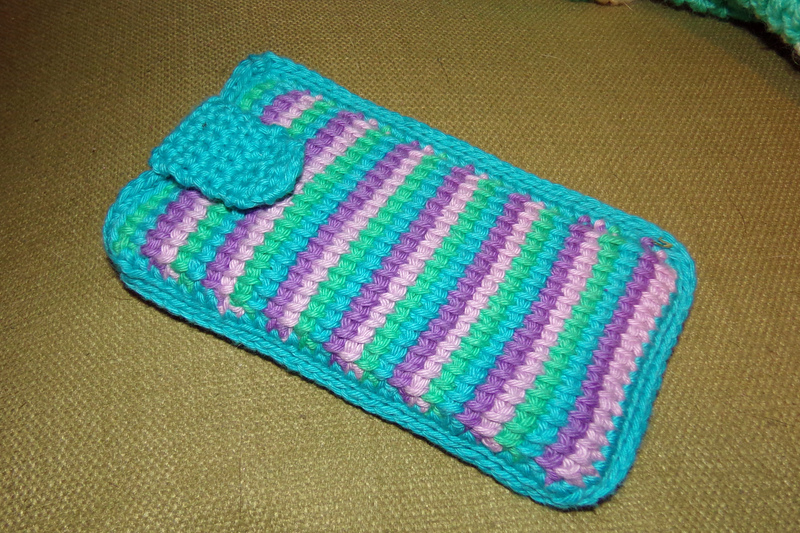 Pondering all those unfinished projects was quite disheartening, so I cheered myself up with a quick easy project: a mobile phone case. I used some of the Stylecraft DK cotton I had left over from my nyac stripey blanket. This is the first Tunisian crochet project that I have finished – but of course not the first one I started! (I have half a cushion cover lurking in the WIP pile.) 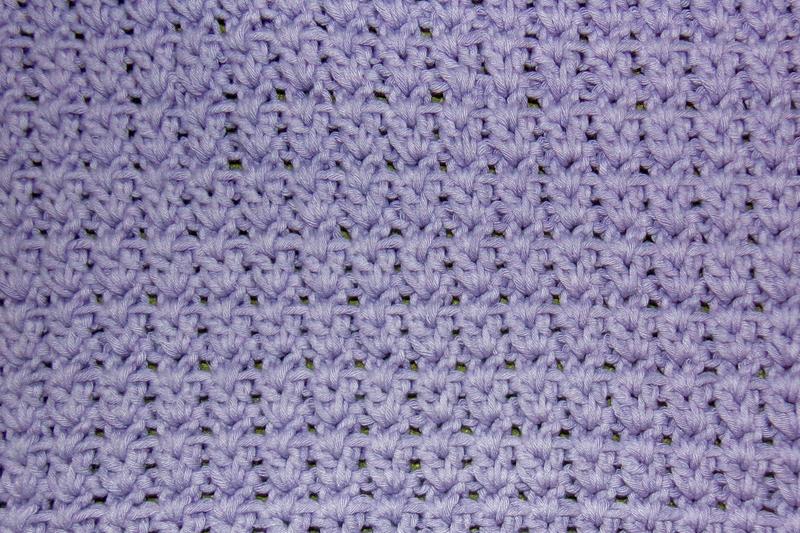 It was just two rectangles of 17 stitches across, worked in the simple or basic stitch, and I stabilised the edges with a round of normal dc before dc-ing them together on three sides. I whipped up a tab to keep it closed and added a popper and it was done! 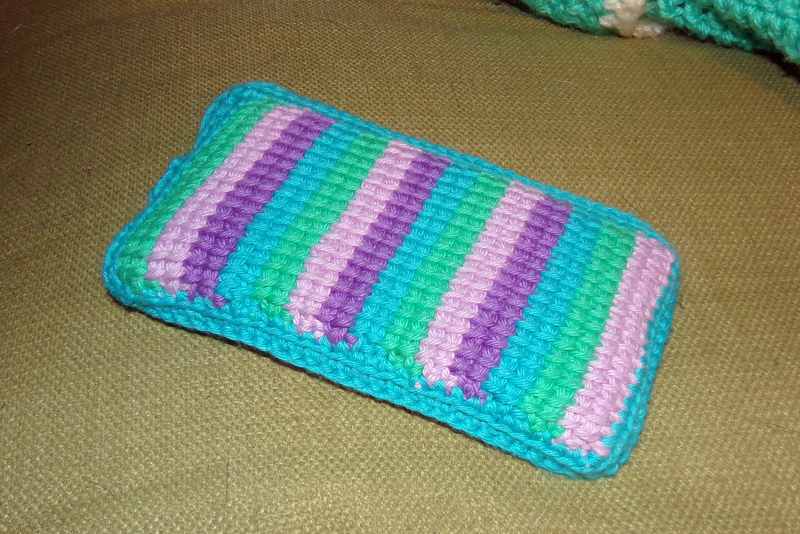 Because it was a small project I just used a normal 4mm crochet hook instead of a Tunisian hook. After chasing down all of those unruly WIPs it was nice to have something neatly finished! Knitted Noro lace shawl – nice! Good luck finding everything else still hovering around! And have fun finishing a few things, it makes everything so worthwhile! Thanks! I’m going to try making more of an effort to finish things, but I am expecting this to have no affect on the overall number of WIPs! I wonder whether there’s a correlation between how long people have been knitting/crocheting, and how many WIPs they have. I say that as someone who used to be a smugly monogamous crafter, but who now has far too many half-done projects scattered around the house. I love your Tunisian crochet, by the way. I have 6 and have only been Crocheting since early summer! Oh ok, that blows my theory out of the water, then! I have lots of different crafts and crafted items in progress, but only one knitting project on the go – I get too confused if I have more than one to focus on. I love how you’ve described the hunt for lost WIPs! Thanks! They do seem to go off on travels of their own. Maybe WIPs are scared of daylight. It would explain why they always seem to seek the darkest corners to hide in!